When I recently browsed through the members list of the forum, I noticed that a lot of you have their own personal blog or website, so... why not create a topic about that? This thread is here for sharing links, posting updates, asking design questions and all else that's somehow related. Tell me about your website! Leave me a link. Do you have a concept for it? What kind of stuff do you post there? What's the one posting that everyone should read? 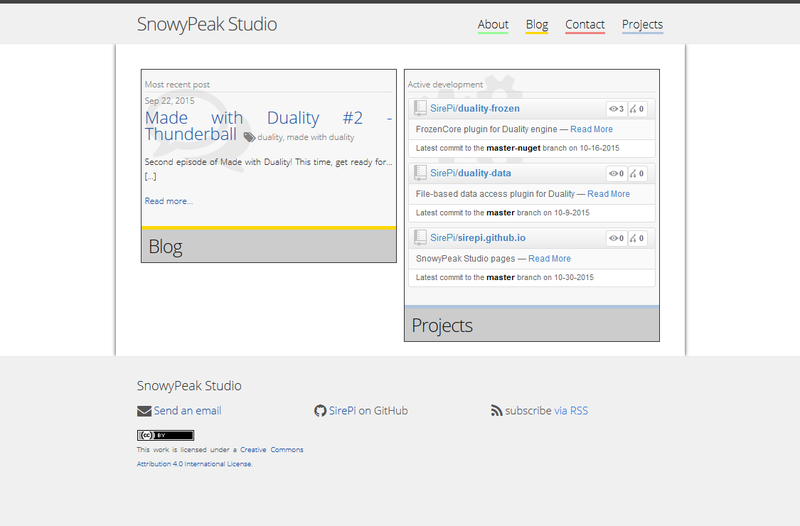 My personal blog is hosted with GitHub Pages and Jekyll. 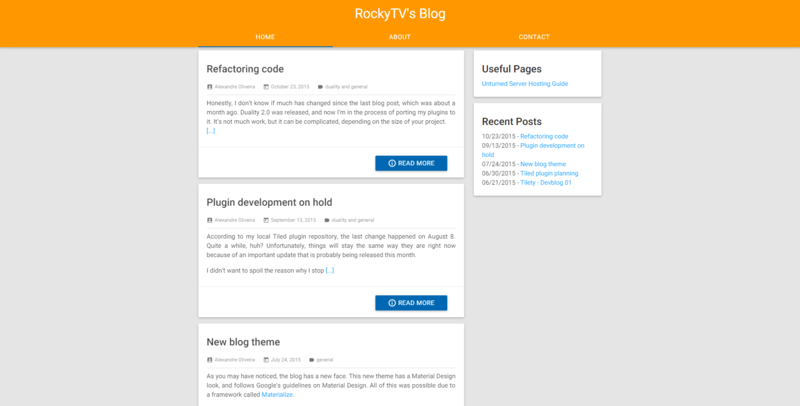 I chose it because it is a nice and simple way to start blogging. Its theme is based on Google's Material Design. I used an external library for it, called Materialize. It's also easy to use. What I post in the blog can be a bit about everything. Currently I only post stuff related to programming (duality game/plugin programming, blog changes, and soon programming in general). What I'd like to ask for you guys is, I have a small sidebar there, and I need help deciding what to add in the sidebar. Without it, according to my friend, the blog just looks like a giant mobile app. So I'm asking for you help to decide what can go in my blog's sidebar! There's no real fixed topic except my interests, which is mostly games and their development. There's a dash of general technology too. 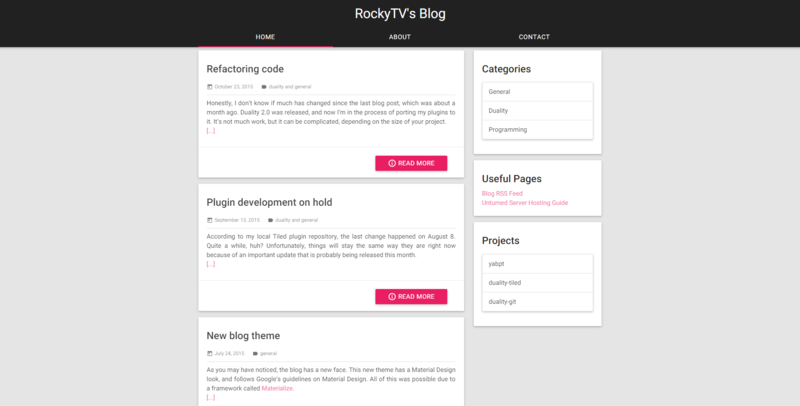 About the sidebar, RockyTV, you don't actually need to add much. Adding too much would make it feel bloated, which is bad, because the page looks very clean right now. What your friend said about it looking like a mobile app isn't necessarily a bad thing. Neat. It's kind of refreshing to see some blogs with a more personal touch (or even just less focused on programming) once in a while. Also: Nice dark style, hsnabn! I've experimented with those on my own blog back then, but found that they are incredibly hard to get right. I'd probably remove the "Recent Posts" one, because it feels a bit redundant - those postings are right there on the front page anyway Alternatively, you could add a sidebar item for Tags / Categories, and maybe a collection of links to your projects. Oh, and maybe a link to the RSS feed of your blog, if there is one? Thank you, but it's actually a built in WordPress.com theme. It's called Minnow. All I did was just select it. 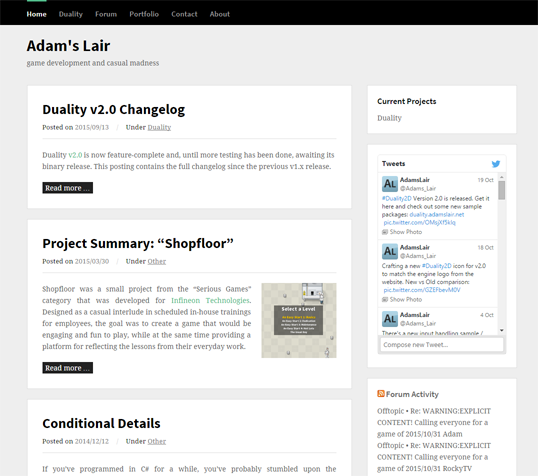 I've also added categories and projects to the sidebar (thanks for reminding me of the categories, Adam!). Mine as well is hosted on GitHub, and is a basic variation of the original Jekyll template they give you at start, though I have a half idea of trying to rebuild it with Bootstrap (and Jekyll), just to add some variation. It's updated whenever I have something to add, and I tend to discuss my improbable projects and the various things that I do (mostly related to programming though). I knew it. I've been doing it wrong all along.